The HoloLens opens up new, digital locales within our physical world, so it was only natural for the HoloLens Challenge to ask developers to create a portal into one. One developer rose to the task and gave life to wall art, turning it into an interactive game called Future Boy. As seen in Milos Paripovic's video above, Future Boy is a painting on the wall that depicts a boy discovering a robot in the attic. The HoloLens identifies the artwork on the wall and initiates the game. While the robot seems friendly at first, it turns violent, forcing the user to defend her or himself against the robot's lasers. An air tap fires back, giving the player a point for hitting the robot and losing a point for hitting the boy. The game ends when the robot lands a successful shot on the player. The main idea is to use AR to see the artwork uploaded from different perspectives to explore and interact with. If the user doesn't have this print, they scan the room so the app can find walls, and then the user can put the virtual copy of the artwork wherever they want and play the game. 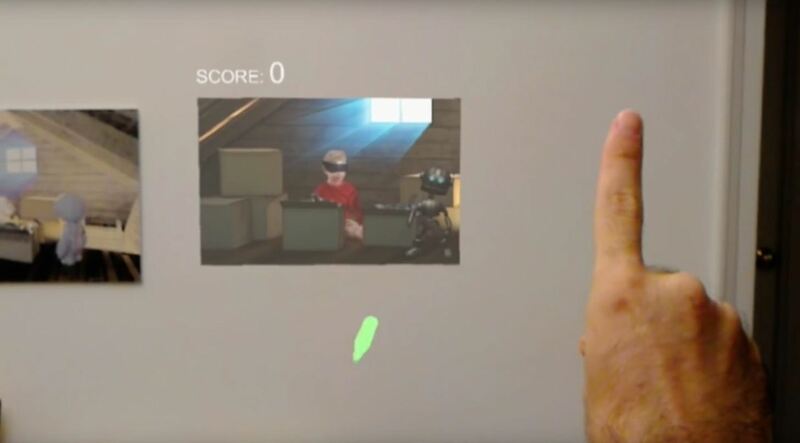 While this simple game itself won't win any awards, it's a fantastic example of how mixed reality experiences can really blend in with the real world. Imagine an entire gallery of art that becomes interactive just by looking at it. That's not the world we live in yet, but it can be soon as Milos has demonstrated. Of course, there are many interesting ways to create portals with mixed reality. Honorable mention Chad Carter created Magic Window, which also demonstrates some excellent potential. It allows you to see the world behind your walls, or essentially peer into a secret digital space through a floating window. Furthermore, you can step through and actually see an altered version of reality where your place is decorated with new furniture, shelving, and more—like a more robust and interesting version of HoloPlanner. Both entries point to some very interesting ways we can interact with the digital world through the HoloLens. Suddenly, anything can change or come to life. Consider the experience if they both worked together and you could step into a hanging image. While that would require a complex installation and some visual trickery, it would really feeling like stepping into someone's imagination. That's one of the incredible places this technology will take us.